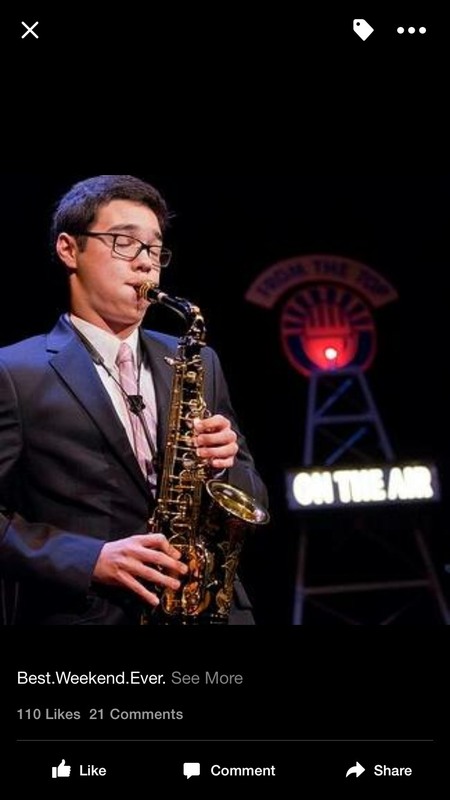 Prologue: My name is Chad Lilley, and I’m a classical saxophonist and Washington DC area native. I appeared on NPR’s From the Top with Host Christopher O’Riley in the fall of my junior year: October 5, 2013, in the near acoustically (and aesthetically) perfect Jordan Hall at The New England Conservatory. In the summer after my sophomore year, I had decided to live audition for the radio show at the infamous Interlochen Arts Camp, where I was in my second camp season. Having no real expectations for being chosen, I threw together a pretty unorthodox audition comprised of an unaccompanied rendition of Rachmaninoff’s “Vocalise”– two and a half steps lower than the original key – and an early twentieth century French waltz, also unaccompanied. I remember walking into the way too reverberant trailer, proudly sporting my Interlochen Blues, only to be greeted by the Honorable Tim Banker and Claire Shepro, a pair of recruiters in the From the Top Production Department. These two friendly faces made my audition process pretty streamlined… well, for the most part (Tim made me replay the opening of the Rachmaninoff because his tape recorder crapped out the first go around). I got a call from Claire a few weeks later notifying me of my status for the show, and asking whether or not I wanted to book for the October showing in none other than From the Top’s hometown: Boston, Massachusetts. Everyone who has appeared on the show can vouch for me when I say it was a near perfect experience. I was on cloud nine. When you get an all-expenses-paid trip to play a sold out show for NPR it’s kind of hard not to be. My first show (linked here – http://www.fromthetop.org/show/boston-ma-278/) was somewhat of an experiment for From the Top. It was a show that included an extended outreach program the day after our performance; it was the first of its kind, and it provided for an incredible weekend (read more about it here – http://www.fromthetop.org/taking-it-from-the-top-at-pope-john-paul-ii-catholic-academy/). I believe I captioned my profile picture action-shot from the show “Best.Weekend.Ever.” which is far from an exaggeration. I thought that with the end of that weekend would come the end of my direct relationship with the folks at From the Top, and that’s how it went, until I received a call from Education Program Manager Michael Dahlberg in January of 2015 offering a purely outreach-oriented dive into the rural towns of Southeastern Kentucky. The decision to attend this event is a whole ‘nother story (check out my story, along with my alumni compadres, here – http://www.fromthetop.org/kentucky-moments-four-arts-leaders-tell-their-stories/), but the sacrifice turned out to be totally worth it. What ended up being born out of this weeklong outreach event was a casual discussion with CEO and founder Jennifer Hurley-Wales about summer activities, which thus turned into a whole new discussion about an internship possibility. Getting the idea off the ground was a little tricky, because I needed to find housing for myself, but fortunately the music world is small, and I lucked out with a small studio not five minutes from the From the Top offices through a mutual musician friend and graduate of the New England Conservatory viola studio. And now, here I stand (er, sit) in my cubicle at 295 Huntington Avenue, Suite 201, writing this post, as I will continue to do for the next five weeks, about my experiences at From the Top as an alum of their show, now working for the company as a summer intern. Chad Lilley is From the Top’s first Beth Klarman Fellow, spending a summer interning with our marketing and program teams.